This month I’ve prepared a special classics Alt+F4 Tribute Mix. It features many productions by Matti Kotala and Joonas Hahmo, but the focus is cleary in their trance project Alt+F4. Enjoy! Tic Tac Trance #104 Replay available! 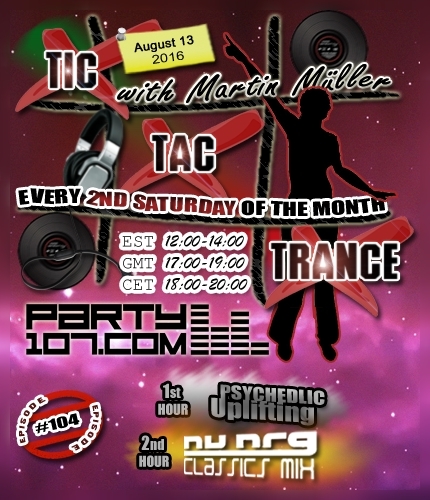 Tic Tac Trance returns on August 13 2016 with episode #104 on Party107.com. For the first hour you can expect an uplifting & psychedelic underground trance mix with upfront tunes! For the second hour I’ve prepared a Classics Mix which includes my favorite Nu NRG tunes! Make sure to tune in! My show air TODAY at 18 CET / 17 GMT / 12 EST.